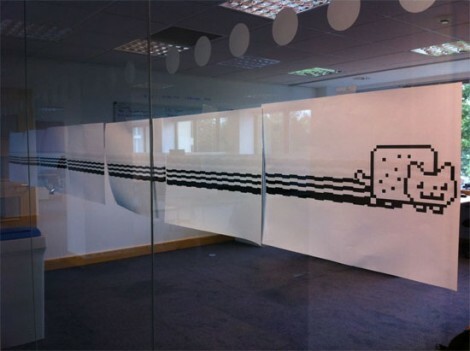 Internet blocked at your office and feel like you’re just not getting your fix of Nyan Cat? Don’t worry, you can now use the fax machine to get your fix. [Tom Scott] put together the project to our delight, which will work best if you can find one of those fax machines that uses the continuous roll of paper. But as you can see above, individual sheets will work too. The best part is that Nyan Fax is live for callers from the UK and internationally! The hack is using something called ‘fax polling’. It allows the sender to set up an on-demand server where any caller will be sent a queue of documents. In this case [Tom] crafted a Nyan Cat document that never ends… you’ll need to disconnect the phone line or pull the pug to stop the printing. See for yourself in the clip after the break. If you’re interested in setting up your own it can be done with the mgetty and sendfax packages on a Linux box. Just in case you’re keeping score, [Tom Scott] is one of the guys behind the Webcycle.